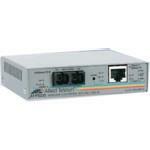 AT-FS200 Series Fast Ethernet bridging media converters are two port, unmanaged and standalone. They convert copper to fiber media, enabling both ports to operate at the same or at different speeds. The FS-232/2 supports additional diagnostic functions.